It feels good to share a new recipe. Its been a while. Well, at least its been a while since I shared a grain-free, low-carb, low-sugar recipe. And this was a good one. Yum. We enjoyed this with some roasted sweet potatoes, onions and sweet red peppers. Hope you enjoy it too!!! Mix together all marinade ingredients. Wrap each chicken thigh with a slice of bacon. Secure the bacon with a toothpick. Place the chicken thighs in a glass casserole dish with a lid. 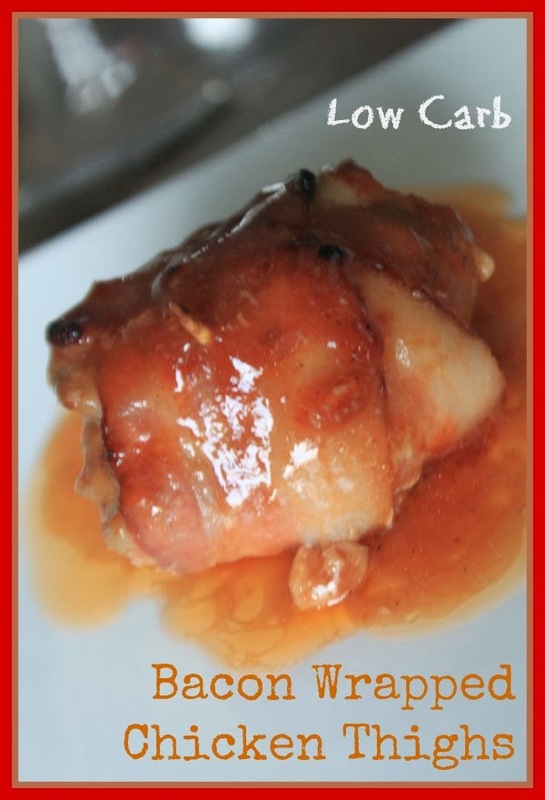 Pour marinade over top of bacon wrapped chicken thighs. Bake for 35 minutes. Remove casserole from oven. Pour off liquid into a sauce pan. Put chicken back into oven with no lid. Broil on low for 5 minutes (or longer - until bacon just starts getting crispy). Meanwhile, heat the sauce to medium/high heat. Add 1 Tbsp of thickener (I used arrowroot). Mix thoroughly until sauce thickens. Remove casserole from oven and pour thickened sauce over top.